What is Accurate Times ? Alternative Prayer Times in High-Latitude Areas. What Is New in This Version of Accurate Times? Accurate Times is the official software adopted by the Jordanian Ministry of Islamic Affairs to calculate the prayer times in Jordan. 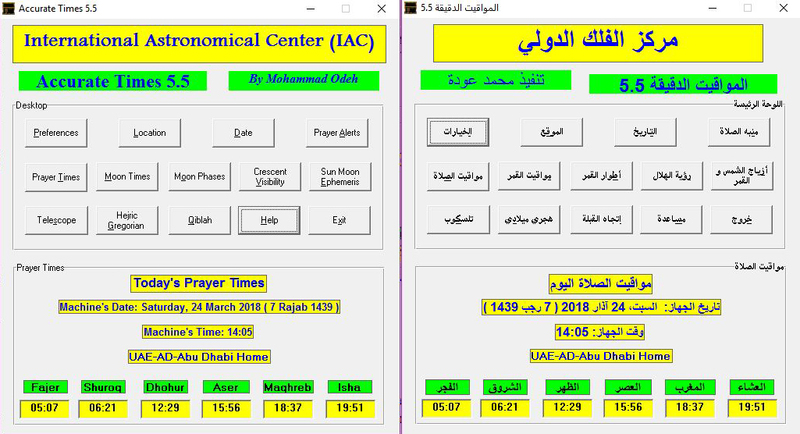 Also, it is the official software to calculate prayer times in UAE. 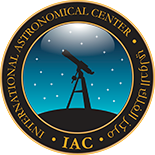 The software runs under Windows, and it is written by Mohammad Odeh, the chairman of International Astronomical Center (IAC). Accurate Times calculates the direction of the Qiblah, that is where to look to face the shortest way to Mecca (Ka'bah). It also calculates the Qiblah time, that is the time at which the Sun is at the Qiblah direction, or when the Sun's shadow is pointing towards the Qiblah direction. Accurate Times shows also the Qiblah World Map; that is a wolrd map which contains the Qiblah direction for the whole world as colored bands. Please find below a small version of the Qiblah World Map. Accurate Times can be used to convert the Hejric date to Gregorian/Julian and vise versa. However, kindly notice that the actual sighting of the crescent is NOT adopted for determining the first day of the Hejric month. Fajer & Isha angles: It is generally agreed that the Fajer prayer or the Isha prayer occurs when the altitude of the Sun's center is 18 degrees below the horizon . However, some countries or organizations prefer to adopt another value, such as 16, 19, or 21 degrees, ...etc. Summer Time: Several countries use the Summer Time, so using this option enables you to get the correct times of the prayers during Summer Time. Addition or subtraction: Some organizations prefer to add or subtract a few minutes of a certain prayer time, such as the Fajer, Dhuhor, or Maghreb. Elevation: Times of sunrise and sunset at a site that is 1000 meters above sea-level for example, will be different than those at sea-level. The Sun rises at a site which is 1000 meter above sea-level, well before it does so at a site located at sea-level. While it sets at the elevated site after it does so at sea-level. At 1000 meters above sea-level, the average difference is somewhere between 5-13 minutes (Depending on the location's latitude). Aser Prayer: The user can choose either the Shafi'i or Hanafi Mazhab. Precision Format: The output results can be either in hh:mm format or hh:mm:ss format. Language: The program supports two languages; Arabic and English. However, both; the help file and the output file are both in English language only. When Fajer and Isha times disappear in High-Latitude areas, Accurate Times can calculate an alternative times. The alternative times are calculated based on the official adopted method in 2009 by the Muslim World League. To know more about this method, please visit this website: ( http://www.icoproject.org/paper.html ). To enable this option, open "Preferences" menu and check the option "Enable Alternative Prayer Time Calculations"
Accurate Times offers two kind of alerts. The first one is few Beeps you hear before a certain time you specify. This can be used to remind you to perform the previous prayer before the next prayer occurs! The second alert is to hear the prayer call (Athan) when it is the time of the prayer. The user has the option to choose to hear either Mecca Athan or Jerusalem Athan. Refraction: For sunrise and sunset, most of the programs adopt the standard value of refraction, that is, 34 arc minutes. However, this value varies within seasons (as a function of temperature and pressure), and this variation could change the time of sunrise and sunset by some dozens of seconds. Thus, it would be better to enter the exact / average values of temperature and pressure for your location. Notice that the standard conditions assume your location's temperature to be 10 C and your location's pressure to be 1010 mbars. But these values are the standard conditions at sea-level. For instance, a site at 1000 meters above sea-level will have a standard pressure of about 900 mbars ! City Settings: City Settings: Accurate Times, can be used to generate prayer times for a specific city. However, it would be a puzzling decision which to choose for calculations; the eastern parts of the city or western parts! This option should be a good solution for this problem. For example, assume that you want to calculate the prayer times for Amman (Capital of Jordan), which is of a 12-Km diameter. So, from the Location menu enter the coordinates of the most western part of Amman, and in the City Settings, enter the number 12. Now when you generate the prayer times for Amman, the times of the Fajer and Shuroq will be calculated for the eastern parts of the city, which is 12 Km to the east of your original coordinates. While the times of Dhohur, Aser, Maghreb and Isha prayers will be calculated for the western parts of Amman. Draws the curve for both; waxing (new) and waning (old) crescent. Shows the possibility of seeing the crescent according to three criteria; Odeh, Yallop and SAAO. Shows the impossible sightings. Where the sighting is considered impossible if the Moon sets before the Sun, or the Topocentric (not Geocentric) conjunction occurs after the sunset. For waning (old) crescent, the sighting is considered impossible if the Moon rises after the Sun, or the Topocentric (not Geocentric) conjunction occurs after the sunrise. Saves the Crescent Visibility World Map as image simply by clicking on a button. Blue: Need Optical Aid : Crescent is visible by optical aid only. Magenta: Could be Seen by Naked Eye: Crescent is visible by optical aid, and it could be seen by naked eye. Green: Easily Visible by Naked Eye: Crescent is easily visible by naked eye. Blue: Need Optical Aid: Will need optical aid to see the crescent. Magenta: May Need Optical Aid: After seeing the crescent by optical aid, it could be seen by naked eye. Yellow: Naked Eye at Perfect Conditions: Visible by naked eye under perfect atmospheric conditions. Blue: Crescent Visibility is Improbable: Seeing the crescent without a telescope or binoculars is exceedingly unlikely. Sighting the moon with optical aid may be possible. Green: Crescent Visibility is Possible: Crescent is visible by naked eye. Red: Impossible: This happens if Moonset occurs before Sunset, or the topocentric conjunction occurs after Sunset. No Color: Not Possible: This happens when the topocentric conjunction occurs before Sunset, and Moonset occurs after Sunset, but the brightness of the crescent is not enough to be seen even by optical aid. Cyan: Unknown: This happens at high latitudes when there is no Moonset/Moonrise event on the visibility day. In such a case, determining the visibility of the crescent needs more sophisticated algorithm than what is currently adopted in Accurate Times. Please highly notice that the visibility of the crescent at the beginning of each zone highly depends on the atmospheric conditions, acuity of vision, experience of the observer and looking at the location of the crescent. When you are observing the lunar crescent, you might use your telescope to slew to the Moon to see the crescent. In this case the telescope will slew to the Moon's center not the crescent! This might be a problem if the pointing accuracy of your telescope is not accurate enough or if your field of view is narrow. In this case you might have the crescent out of view! This is very serious when you are observing a challenging crescent especially with the CCD imaging technique, where you might not see the crescent until you do some image processing! So it is essential to point exactly at the crescent not the Moon! For this purpose Accurate Times has introduced a new feature to calculate the coordinates of the crescent itself, and then you can enter these coordinates to your telescope to let it slew exactly to the crescent's location! Notice that some telescopes calculate the refraction and takes this effect into account, while others do not! They just go exactly to the entered coordinates without any compensation for the refraction. This might be also a serious problem if you are observing a low-altitude crescent! Thus, at first you have to know whether your telescope calculates the refraction or not! If it does not calculate the refraction, then the entered coordinates should be corrected for refraction, and in this case you should choose "Refracted" option from the "Telescope Coordinates" settings in Accurate Times menu, where as if your telescope calculates the refraction, then you should choose "Airless". In addition, some telescopes use the J2000 coordinates reference for the entered coordinates, while others use the JNow reference, so you should refer to the manufacturer of your telescope to know which reference should be used. All care was taken to ensure the most accurate results. Comparing the results of Accurate Times software with those of the Astronomical Almanac, it was found that ALL the results were exactly the same, within an accuracy of about one second, except for the Dhohur time where the maximum error was about 0.03 second! If you have problem in running Accurate Times in Windows Vista or Windows 7 editions, then make please sure not to place "Accurate Times" folder under "Program Files" folder. It is recommended to install it directly on your "C" or "D" drive. Special thanks go to people who offered their kind assistance or suggestions, such as: Mr. Ahmad Al-Ashi, Mr. Ahmad Niamat, Dr. Bernard Yallop, Prof. Hasan Bilani, Mr. Jean Meeus, Mr. Marwan Shweaki, Mr. Mohammed Al-Hati, Dr. Tarek Katbeh, Mr. Yousof Kutkut and Mr. Tareq Hadi. Accurate Times 5.6 released on 20 February 2019. - Refraction is calculated now using very accurate equations, which is the method of Hohenkerk & Sinclair (NAO Technical Notes 59 and 63, subsequently adopted in the Explanatory Supplement to the Astronomical Almanac, 1992 - see section 3.281.). - Fix bug in Delta T values during the period 1800 to 1860 CE. - For Asr prayer time, the effect of atmospheric refraction at noon time is added. - Revised locations for the following countries: Iraq, Saudi Arabia, UAE, Qatar, Bahrain, Kuwait, Yemen, Jordan, Palestine, Egypt, Libya, Tunisia. - Moon House calculations is added to Accurate Times: Now you can calculate the House of the Moon (Manazil Al-Qamar). This is found in "Sun and Moon Ephemeris", where you should choose The Moon in this menu and select the needed period of time. Kindly notice that the length of each House is NOT 13 degrees. Instead, each House is given its actual length, thus it is normal for the Moon to be in the same Moon House on two successive days, and it is also possible for the Moon to move across two Houses within one day. - Fix bug in Telescope menu. - "Telescope Control" menu is added. This menu calculates the coordinates of the crescent which helps in pointing the telescope exactly to the location of the crescent instead of the Moon's center. - More Accurate Delta T Calculation. - Fix the coordinates of some cities. - Fix the error found in Vista and Windows 7 when changing the location or date. - Fix the Athan release problem in Vista and Windows 7. - Fix the wrong times in Fajr and Isha in the main menu for high latitude areas when the alternative times method is enabled. - New Locations in Europe are Added. - Calculating Alternative Prayer Times in High-Latitude Areas when Fajer and Isha Prayer Times are Not Available. - Fix a bug in Summer Time for Southern Hemisphere. - Better screen view at 800X600 screen resolution for both; Crescent Visibility Map and Worldwide Qiblah Map. - Fix a bug causes Run-Time Error when doing some calculations if the decimal separator is comma instead of dot. - Qiblah World Map was added. - Waxing (New) and waning (Old) crescent visibility maps were added. - Calculations for Sun and Moon Ephemeris. - Moon Coordinates are calculated using ELP 2000-85 theory. Thus, Moon Times and Moon Phases are much accurate than previous versions. - Geocentric or Topocentric Moon Phases Calculation was added. - Find the time at which the Sun's shadow points towards Qiblah direction. - The effect of Delta T is included for Prayer and Moon Times. - A bug in Qiblah Times which reduced the accuracy for about one minute in some locations at some dates was fixed. - More reliable prayer times at high latitudes. - Incorrect Moon times at some locations was fixed. - Incorrect Qiblah times at some locations was fixed. - Today's prayer times appear automatically on the main menu. - Special Athan for Fajer prayer. - The option to hear either Mecca Athan or Jerusalem Athan. - Add an icon in the task bar. - The time of next prayer appears when the mouse is put above the task bar icon. - Run-time error at Windows XP startup was fixed. - Failed installation on Windows NT was fixed. - Add a progress bar on the waiting form. Kindly click here to download Accurate Times (3.7 MB). From 'Start' / 'Programs' / 'Accurate Times' uninstall AT. Now install the new version of AT.